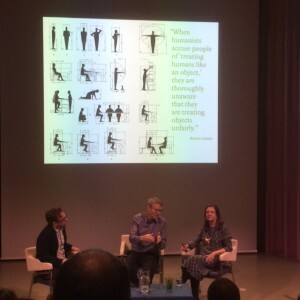 wonderful talks at the New Institute Rotterdam by Mark Wigley and Beatriz Colomina who presented their little book; ‘Are we Human?’; a kind of summary of the 3rd. Istanbul Design Biennale 2016. Especially the link made by Wigley to Constant (Wigley wrote his great book: ‘the Hyper-Architecture of Desire’ about New Babylon, 1998) about the moment Constant could longer envision man in his environments was a fine illustration of the problems we encounter with technology. Dirk van den Heuvel (TUD), Mark Wigley, Beatriz Colomina. Yesterday, January 17th., the Humans Issue, the 5th. 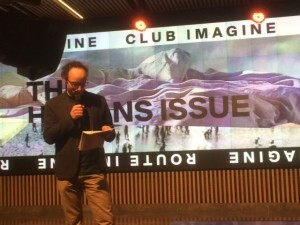 late afternoon session of Club Imagine in the Theatre Rotterdam. With a focus on humanity and a close link to the arts and imagination we address the relation between art and science, public and collective. Part of the art-images will be presented on the media-wall soon. Next session on March 14th. about utopian futures.